Hiya guys! 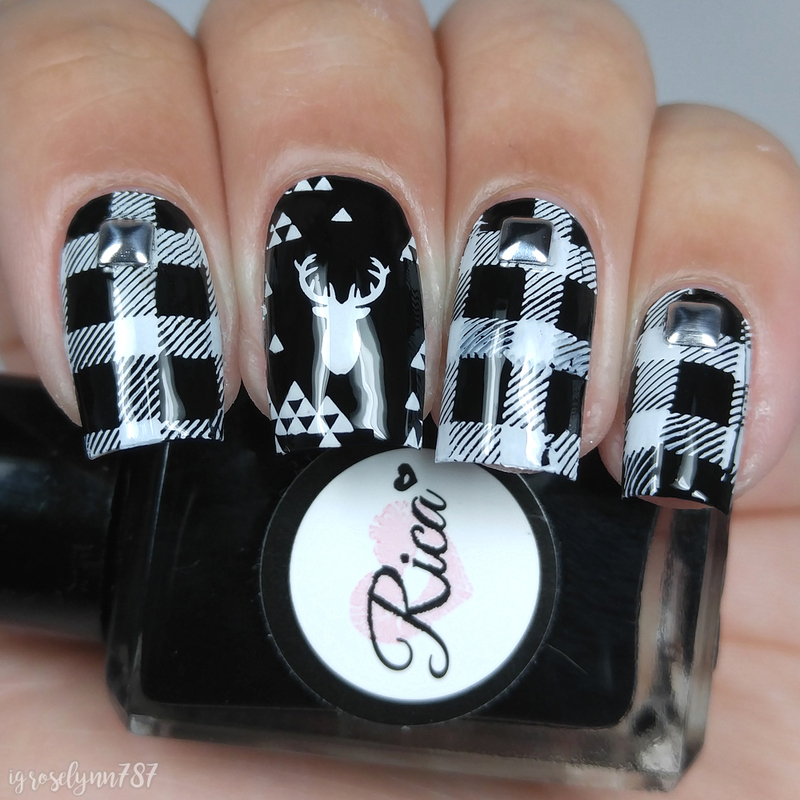 Today I'm sharing another manicure for The Digit-al Dozen's Black Out week. 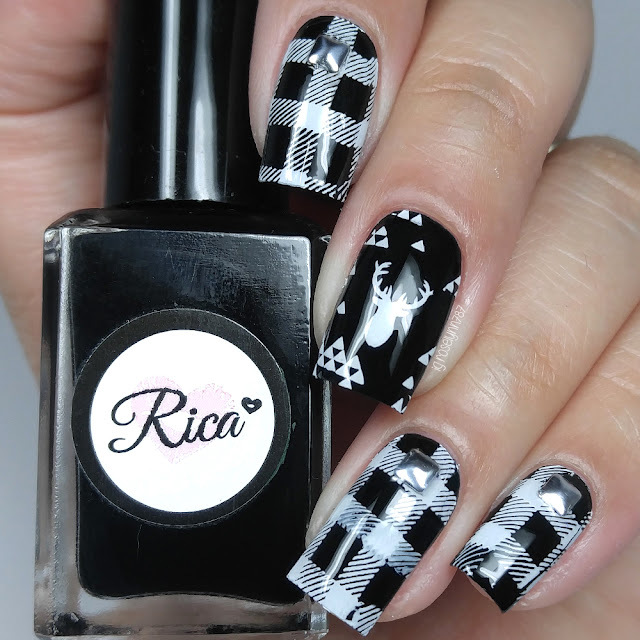 Again I went for a simple approach with some black and white stamping. It has a very woodsy feel to it with the whole deer head and plaid pattern. I wish I would have done this in red and black instead actually. I think it would have made the camp vibe harder. That said, I do this black makes plaid really chic. Take a look! What do you guys this of this manicure? I thought of this manicure months ago, but couldn't find the energy to do it. 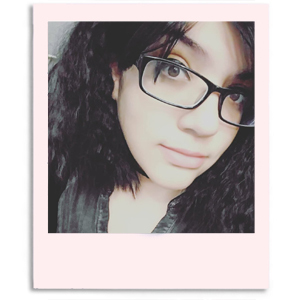 Also can I point out how much I love it for being so not me? Haha. I'm definitely a big time city girl who wouldn't be caught camping. All it makes me think about is breaking nails and bugs in my face. No thanks, I'll live through my stamping XD. If you're impressed by the placement of the image on my middle nail, then don't be. It took me close to half a dozen tries before I got it straight. Don't get me wrong, using a clear stamper is a major advantage. But it doesn't do all the work for you, you'll still have to position it well. That said, I can't image a life without my clear stamper now. By far one of the most revolutionary tools in my nail arsenal. Have you guys noticed an obsession with a particular polish this week? If you haven't guessed by now then let me point out how much I love Rica Polish Blackout and Whiteout. They are both one coat wonders that are perfect for stamping. Highly recommend them. These last two bottles were sent as a gift from the maker, but I was purchasing these long before that. Finally I have this manicure out of my head and onto my nails! I have literally wanted to use this stamping since I first received it back in the Fall. Yup, it was torture! Haha. Anyway be sure to check out the other talented ladies from the Digit-al Dozen and their nail art during Black-Out week. I love the black & white plaid! 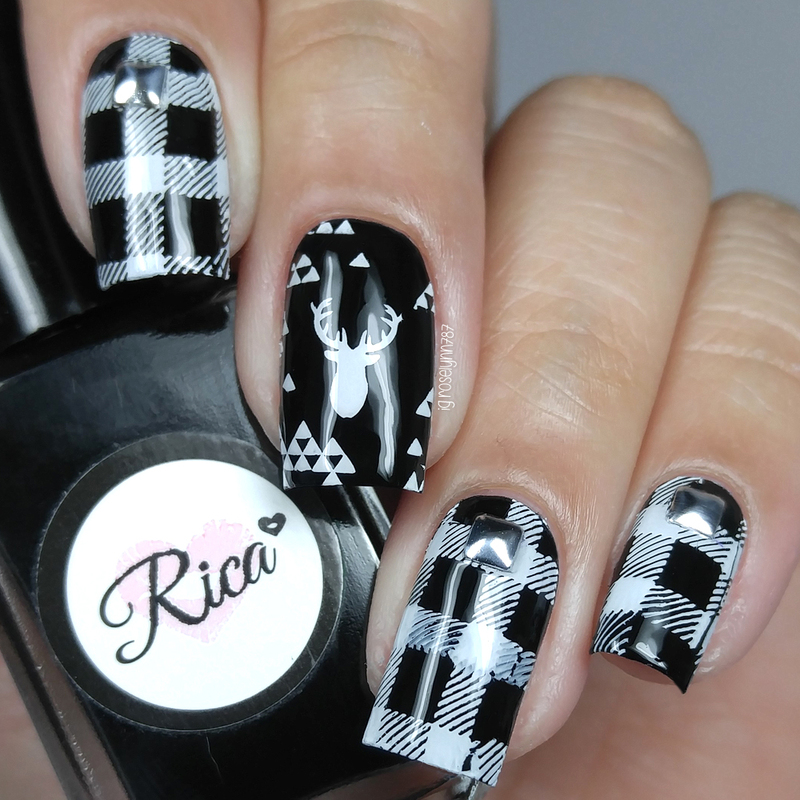 Those plaid nails, though! They're perfect!